​Compare Home Air Purifiers: GermGuardian AC4825, GermGuardian AC5000, Honeywell 50250-S, Honeywell HPA300 or Coway AP-1512HH? Air born polluters (such as dust, pollen, mold spores, pet dander, mite feces, smoke, etc.) that can be found in our homes can act as allergens causing serious allergies, even asthma in sensitive people. In addition, volatile organic compounds and germs (such as bacteria and viruses) that can be found in the air we breathe in our homes can cause various illnesses. Air purifiers are used to reduce or eliminate the concentration of these harmful airborne contaminants. Nowadays, the best air purifiers are expected to be equipped at least with a carbon activated filter to eliminate odors and collect some of the dust and lint, and a HEPA filter to get rid of most of the airborne allergens. HEPA filters can capture up to 99.97% of dust and allergens as small as .3 microns in size! Certain air purifiers are also equipped with UV-C (Ultraviolet C) light bulbs whose ultraviolet emissions can kill microorganisms such as bacteria and viruses including rhinovirus, E. coli, and streptococcus. You can even find air purifiers equipped with an ionizer that boosts cleaning power, eliminates pollutants more effectively and freshens the air. Finally, some more advanced and smarter air purifiers can automatically adjust the airflow speed based on the air quality level, and when no pollution is detected for a certain amount of time, they can automatically stop to save energy consumption. This article will compare home air purifiers GermGuard AC4825, GermGuard AC5000, Honeywell 50250-S, Honeywell HPA300 and Coway AP-1512HH. These were not just the most popular among Amazon customers at the time this article was written, but they had also received excellent reviews from most Amazon buyers (average ratings of 4.5 and 4.0 stars out of 5 stars!). Selected Air Purifiers on Amazon. Stage 1: Pre-filter (activated carbon): Captures initial dust and allergen particles and helps reduce unpleasant odors . Stage 2: Charcoal filter: Captures particles like dust and lint. Destroys common household odors. Contributes to the control and prevention of the growth of bacteria, germs and mold. Stage 3: True HEPA filter: Captures 99.97% of airborne particles and allergens, as small as 0.3 microns in size, such as dust, pollen, tobacco smoke, cooking smoke, fireplace smoke, pet dander and mold spores. Stage 4: UV-C filter: Enhances the elimination of airborne germs (bacteria, viruses, etc.). Titanium Dioxide is activated by the UV-C light to decompose remaining odor molecules caused by smoking, cooking and pets. Stage 1: Pre-filter (activated carbon): Helps reduce unpleasant odors and captures large particles like dust, pet fur or lint. Stage 2: True HEPA filter: Captures 99.97% of airborne particles and allergens, as small as 0.3 microns in size, such as dust, pollen, tobacco smoke, cooking smoke, fireplace smoke, pet dander and mold spores. Stage 1: Pre-filter captures large particles like hair, fur and dust by micro-mesh. Stage 2: Carbon filter eliminates smaller particles, bad odors and harmful gases by advanced activated carbon. Stage 3: True HEPA filter captures 99.97% of airborne particles and allergens, as small as 0.3 microns in size, such as dust, pollen, tobacco smoke, cooking smoke, fireplace smoke, pet dander and mold spores. Stage 4: Ionizer for eliminating pollutants effectively. It boosts cleaning power and freshens the air. It can be turned on and off. True HEPA filters are proven to capture 99.97% of airborne allergens as small as 0.3 microns in size such as household dust, pet dander, mold spores, tobacco smoke, cooking smoke, fireplace smoke, pollen, etc. According to the American Academy of Pediatric Allergy and Immunology, doctors recommend HEPA air filtration to reduce exposure to indoor asthma triggers. All five air purifiers use activated carbon filters to reduce odors. With GermGuardian air purifiers, in addition, the Titanium Dioxide activated by the UV-C light contributes to the elimination of odors by decomposing odor molecules from various sources. Coway AP-1512HH has an ionizer stage that eliminates pollutants like dust more effectively and freshens the air. The ionizer is intended to alter the dust particles polarity from positive to negative. The negative ions force any dust to drop from the air instead of circulating in the room. Auto Mode: Coway automatically adjusts the airflow speed based on the air quality level. Eco Mode: When no pollution is detected for 30 minutes, the Coway fan will automatically stop to save energy consumption. Coway is equipped with an intuitive air quality indicator by visible colors. Honeywell AC5000 is equipped with an auto shut-off timer that can be set for 2, 4, or 8 hours. Coway AP-1512HH is equipped with an auto shut-off timer that can be set for 1, 4, or 8 hours. For GermGuardian AC4825: FILTER B (FLT4825). For GermGuardian AC5000 : FILTER C (FLT5000). Both Honeywell air purifiers are equipped with two electronic filter check lights to remind you when to check and replace the HEPA filter and the pre-filter. The HEPA filters should be replaced every 12 months, and the pre-filters every 3 months, depending on operating conditions. For Honeywell 50250-S and HPA300: HRF-AP1 Pre-Filter. For Honeywell 50250-S: 2400 HEPA Filter. For Honeywell HPA300: HRF-R3 HEPA Filter. Coway has an indicator light to tell you when the filter needs replacing. The filters (pre-filter, carbon filter, and HEPA filter) are easy to install from the front of the unit. A filter pack is available on Amazon and includes the HEPA and two carbon filters (see Amazon section below for replacement filter pack for Coway AP-1512HH). For GermGuardian AC4825: Replacement bulb: LB4000. For GerGuardian AC5000 : Replacement bulb: LB5000. In a small room, both Honeywell 50250-S and HPA300 can be a bit loud when the highest setting is selected. But in larger rooms, for which these units have been designed, the noise is barely noticeable. At low setting, the noise is quite negligible and not bothersome at all, even in smaller rooms. Similarly, the GermGuardian units are very quiet at low setting and the sound increases as the intensity setting increases. The noise produced can be compared to that produced by a fan or small heater, not particularly loud or annoying. Coway is not noisy at low speeds, but can be a bit loud when the highest speed is selected, though it is not overwhelming: you don't have to raise your voice to communicate when it is running at the highest speed. Devices carrying the Energy Star service mark, such as computer products, kitchen appliances, home improvement products, etc. generally use 20–30% less energy than required by federal standards. The CADR (Clean Air Delivery Rate) indicates the volume of filtered air delivered by an air purifier. The higher the CADR number, the faster the unit filters tobacco smoke, pollen and dust from the air. So which of the five air purifies is best for you? The five air purifiers considered here are excellent products as shown by the average rating each had received from Amazon customers at the time this article was written. Indeed, both GermGuardian units, the Honewell HPA300 and Coway AP-1512HH had received 4.5 stars (out of 5 stars) and Honeywell 50250-S had received 4 stars. There is a good chance that you would be quite happy with any of these five products. 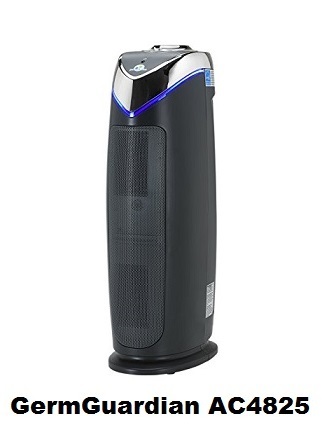 GermGuardian air purifiers come with germ killing UV-C filtering. 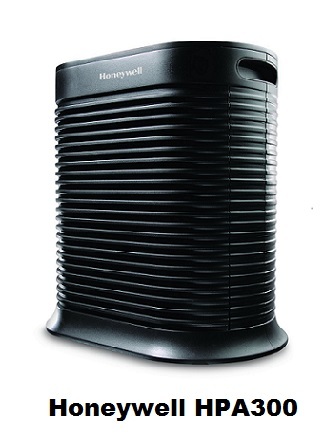 ​GermGuardian air purifiers have 4 stages of filtering as opposed to two for the Honewell units. ​GermGuardian units are lighter and therefore easier to move around. Both Honeywell and Coway air purifiers have a higher CADR rating (see Note 10 above for CADR definition) than the GermGuardian units. Therefore, if you are more worried of having allergens at your place than having germs, you may want to consider one of the two Honeywell air purifiers. Only Honewell HPA300 and Coway AP-1512HH are equipped with a timer. Only Coway AP-1512HH is equipped with ionizer stage. 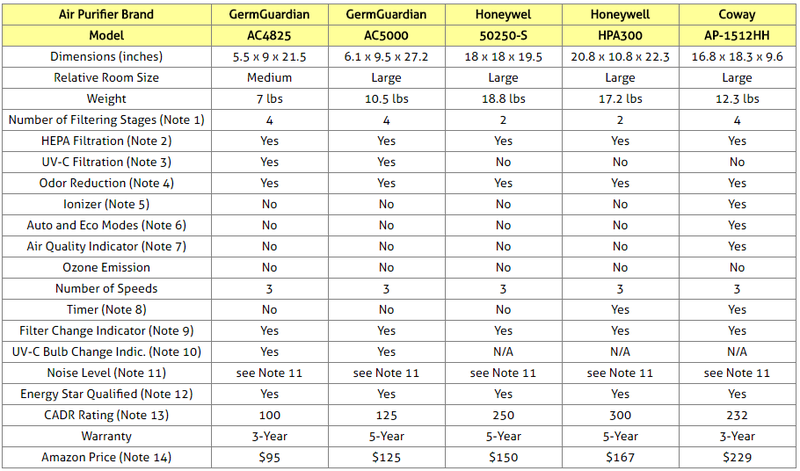 Only Coway AP-1512HH has the smart AUTO and ECO modes (see Note 6 in the above comparison table). 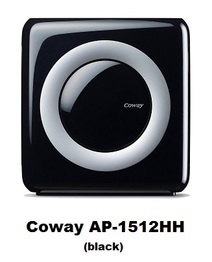 Only Coway AP-1512HH is equipped with an air quality indicator. 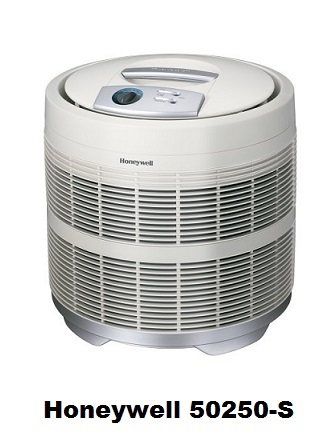 Humidifies dry room air while simultaneously purifying it by removing dust, pollen, pet dander, and other allergens. No filter or replacement items needed to operate the unit - water is the filter. No "white dust" common with other humidifiers. Auto shut-off with water refill indicator light. 1.4 gallon, 2 gallon or 3 gallon capacity depending on the size of the unit chosen. Note that when you click the Amazon product link below, you will get a choice of different unit sizes designed for different room sizes (200 sq-ft, 400 sq-ft and 800 sq-ft). Offers 3-in-1 functionality. Purifies the air all year round while its heating the whole room or cool you as a fan. ​It is equipped with a HEPA filter that can remove 99.97% of allergens and pollutants as small as 0.3 microns. The active carbon layer captures odors and harmful toxins. It supports the Dyson Jet Focus Control technology for focused or diffused airflow. It has an auto mode, a sleep timer, a night-time mode and an easy-to-clean aperture. 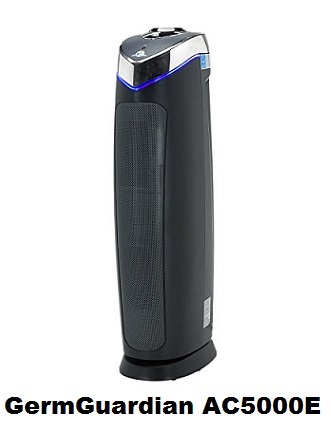 The Dyson Pure Hot+Cool Link Air Purifier is offered below on Amazon.